The necessary physical concepts such as continuum mechanics, rheological behavior and measurement methods, and thermal science with its application to heating-cooling problems and implications for flow behavior are analyzed in detail. This knowledge is then applied to key processing methods, including single-screw extrusion and extrusion die flow, twin-screw extrusion and its applications, injection molding, calendering, and processes involving stretching. With many exercises with solutions offered throughout the book to reinforce the concepts presented, and extensive illustrations, this is an essential guide for mastering the art of plastics processing. 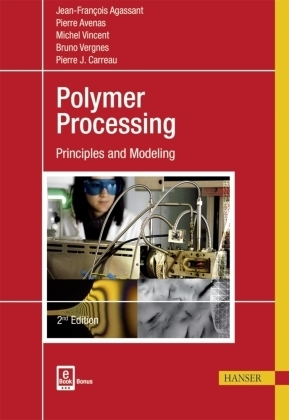 Practical and didactic, Polymer Processing: Principles and Modeling is intended for engineers and technicians of the profession, as well as for advanced students in Polymer Science and Plastics Engineering. Jean-François Agassant is Head of the Material and Mechanical Engineering Department at MINES ParisTech and head of MINES ParisTech in Sophia-Antipolis. Pierre Avenas is former Director of the Center for Material Forming (CEMEF) of MINES ParisTech and held several senior positions in French government research policy and in industry, notably managing R&D Chemistry at Total Group until 2004. Bruno Vergnes is Research Director at the Polymer and Composites research unit of the Center for Material Forming (CEMEF) of MINES ParisTech and an expert in rheology and extrusion processes. Michel Vincent is CNRS Research Director at the Polymer and Composite research unit of the Center for Material Forming (CEMEF) of MINES ParisTech and expert in injection molding and composite processing.